RM500 Malaysian Banknotes, which is now is not legal tender, but still valid for exchange at Bank Negara Malaysia for legal tender cash. According to statement from BNM's website, annoucement of the demonetisation of RM500 was made on 12 September 1998, and ceased to be legal tender effective from 1 July 1999. Total printed and circulated to market was 1,989,479 pieces. At time of announcement, BNM expecting that there were less than 200,000 pieces of combined RM500 and RM1000 in the circulation. 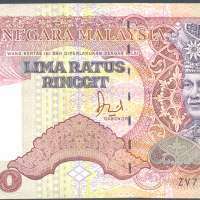 On May 1999, Bank Negara Malaysia had issued an reminder to the public that effective on 1 July 1999 the currency notes of RM500 and RM1000 denominations (2nd Series of Malaysian Banknotes) will be demonetized and shall cease to be legal tender. According to Banking Info FAQs, the note has been taken out from circulation and withdrawn it legal tender status was to complement the exchange control measures introduced in 1998. In a parliament answer given by the Deputy Finance Minister, he has pointed out there are still 150,599 and 26,018 pieces of RM500 and RM1000 respectively that have yet to be "recalled" by BNM. In other words, a total of RM75,299,500.00 of RM500 and RM26,018,000.00 of RM1000 have been ceased to be legal tender but are still around. As of 30 January 2011, BNM has withdrawn 92.4% of RM500 and 99.4% of RM1000 note from the public circulation. 1987 (No date) New series. The design generally similar to M57, but improved & additional security features. Vertical serial number printed in red, metallic silver feature, intermittent "stardust" security thread etc. Signed by the Bank's Governer Dato' Jaffar Hussein. Engraved and printed by Thomas De La Rue & Co Ltd. Multicolored. 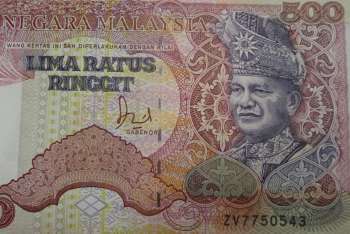 This type of banknote (and signed by earlier Governor) was issued back from 1982. 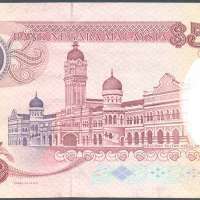 The obverse features the portrait of the first Seri Paduka Baginda Yang di-Pertuan Agong with some traditional carving, while the reverse features the Sultan Abdul Samad Building located at Independence Square in Kuala Lumpur. It only have one prefix for normal banknote: ZV. Replacement note prefix is ZX, but rarely seen. This note was printed in 1985 by Thomas de la Rue & Co Ltd.